Rehabilitation of arthritis in a dog or cat can be a time consuming and difficult process requiring a dedicated team. Persuading a client to dedicate time and money to a pet’s potentially lifelong arthritis rehabilitation isn’t easy, experts say. But educating owners to be proactive can delay the onset and severity of the disease and lead to a more therapy-receptive client. 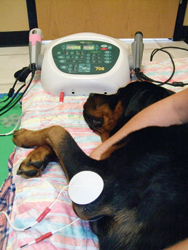 A dog receives electrical muscle stimulation after arthroscopy for arthritis. More modalities than ever are available for patients suffering from arthritis pain, certified veterinary rehabilitators say. 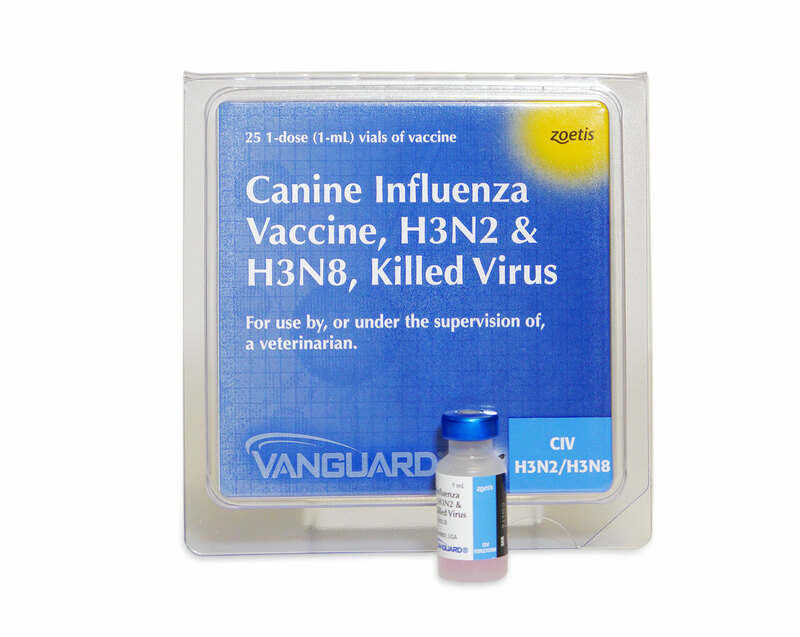 The key to maximizing the benefits, they say, lies in veterinary and client education along with an appropriate diagnosis. Veterinarians looking to provide rehabilitation services need a general understanding of the available therapies, Dr. Van Dyke says. Deep-water swimming strengthens muscles and improves aerobic fitness without taxing the joints. More veterinarians are educating themselves on the best practices in animal rehabilitation through the Canine Rehabilitation Institute. The school has had 750 graduates. “About 85 percent of our classes are composed of veterinarians and the rest are veterinary technicians, physical therapists and physical therapist assistants,” Van Dyke says. Using nutraceuticals first for pain control is very popular, says Christie Carlo, DVM, of Avondale Veterinary Healthcare Complex in Des Moines, Iowa. Using prescription medications long term can raise the risk of side effects and can be financially taxing. “I try to use nutraceuticals like glucosamine and chondroitin as much as possible, which can be given to dogs and cats,” Dr. Carlo says. 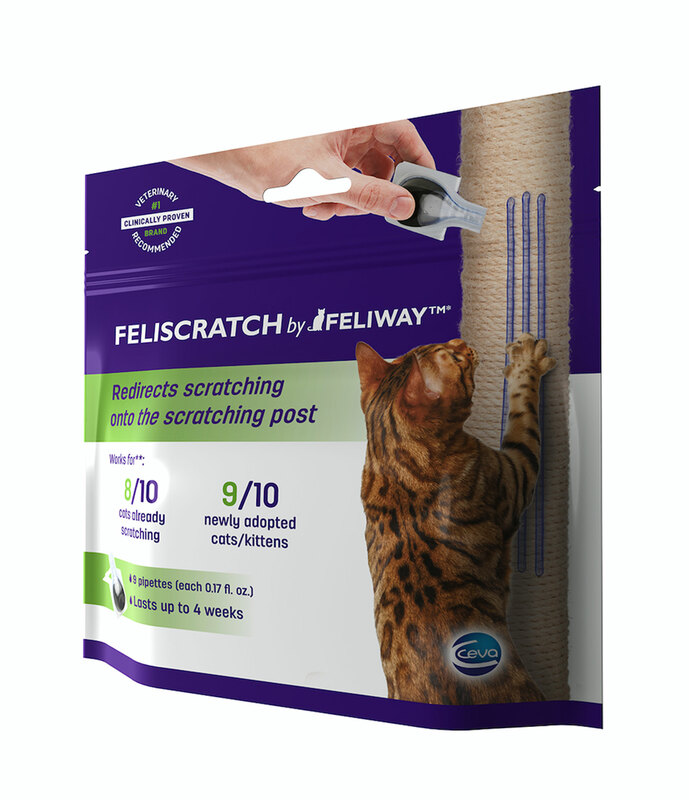 Arthritis in cats is more difficult to diagnose, complicating rehabilitation efforts. Veterinarians say the first apparent clinical sign of feline arthritis is the animal’s inability or lack of desire to jump onto elevated surfaces. “We see a lot fewer cats than dogs,” says Sherman Canapp, DVM, MS, CCRT, Dipl. ACVS. He is owner and chief of staff at the Veterinary Orthopedic & Sports Medicine Center in Annapolis Junction, Md. Before physical therapy is effective, arthritis pain must be managed medicinally to reduce inflammation and make limb manipulation possible, Carlo says. Properly diagnosing the cause of arthritis is equally vital. Giving a pill may be convenient for owners, but it’s a Band-Aid approach and can lead to further medical problems, some specialists say. Rehabilitators are always open to new drug options, says Nan Boss, DVM, owner of Best Friends Veterinary Center in Grafton, Wis. While rehab encompasses gradual, new additions to the regimen, drugs are needed for more immediate pain relief. 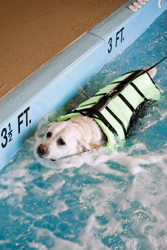 Hydrotherapy—either on an underwater treadmill or in a pool—can be a valuable tool in veterinary rehabilitation. “Underwater treadmill therapy utilizes the buoyancy, resistance and hydrostatic properties of water to promote an increase range of motion of joints in a regulated environment,” Canapp says. “Swimming also uses these properties to strengthen muscles and promote aerobic fitness without impact on joints. “These two modalities are useful when used correctly and at the proper time in injury and post-surgical situations. It is important that the rehabilitation therapist properly assesses the dog’s healing process and schedules these more vigorous therapies at the appropriate time of healing. 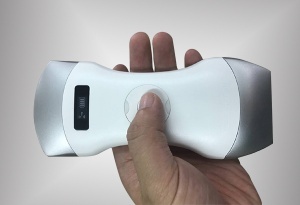 Another rehabilitation modality is laser therapy. Veterinarians who have taken the plunge on therapeutic lasers say the treatment is easy on patients and takes minimal time. Knowing the treatment goals before choosing a modality is important, Carlo adds. Manual therapy is something that can be done at the practice or at home, veterinarians say. Massaging joints and bringing joints through the full range of motion helps an animal while it is lying down. Making sure the joints are well lubricated is crucial before owners perform this therapy. Experts say home care is an essential step in maximizing rehabilitation. Make physical therapy a game for the pets and they’ll be much more likely to participate. This article first appeared in the February 2010 issue of Veterinary Practice News.